Dytran Instruments have recently introduced their first IEPE type accelerometer capable of being used up to 200 degrees Celcius. 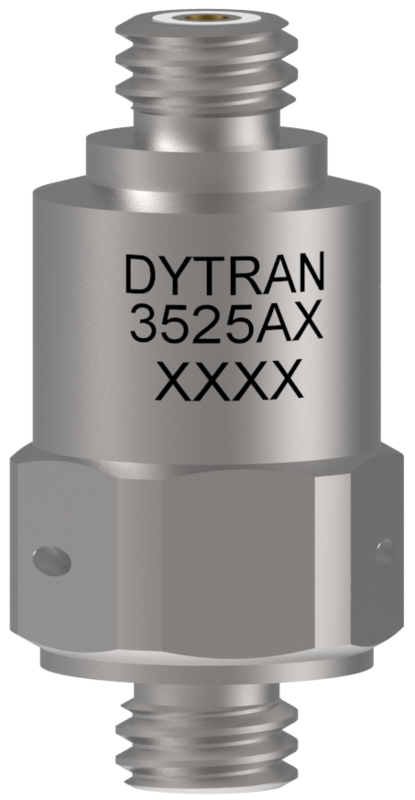 This model 3525A3 is among the world’s first quartz accelerometers to operate at 200°C continuously with internal electronics. Typically, measurements at this temperature require a charge mode sensor with an in-line IEPE charge amplifier, but this new design eliminates the need for the in-line amplifier, thus reducing cost and complexity. The 3525A3 utilises an inverted quartz element to minimise the unwanted effects of base strain on the accelerometer signal, with quartz providing long term thermal stability and a low thermal coefficient of sensitivity, so the sensor changes very little in sensitivity from room temperature to 200°C. With a 10mV/g sensitivity (500g range), this sensor comes in a hermetically sealed stainless-steel housing with an industry standard 10-32 coaxial connector and a 10-32 integral mounting stud. The sensor has a frequency range of 5 to 10,000 Hz, is about 17mm high and 10mm diameter and weighs just 6.8 grams. The small size makes it ideal for use in locations inaccessible to larger high temperature accelerometers. Typical applications would include downhole vibration and shock measurements, environmental test chambers, automobile applications including engine and exhaust hot zones, and any general-purpose high temperature vibration application. Please ask for detailed specifications for this new 3525A3 accelerometer and look out for more new designs benefiting from the high temperature electronics.